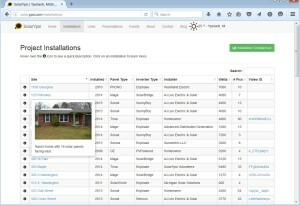 As the number of solar installations grows in Ypsilanti and on the SolarYpsi website, it was getting harder to organize the data and cross checking the data to make sure everything was correct. (This is a GOOD problem!) Also, with the SolarYpsi.org developer, Nik Estep, moving on to other projects we needed to find a new developer and give them the task of making a new SolarYpsi installation page. Introducing Josh Taylor from SAMSA. SAMSA is a web development company located in downtown Ypsilanti. SolarYpsi hired Josh to make some changes to the internals of the SolarYpsi website and to create a new “Installation” page for the website. Josh did a great job very quickly. 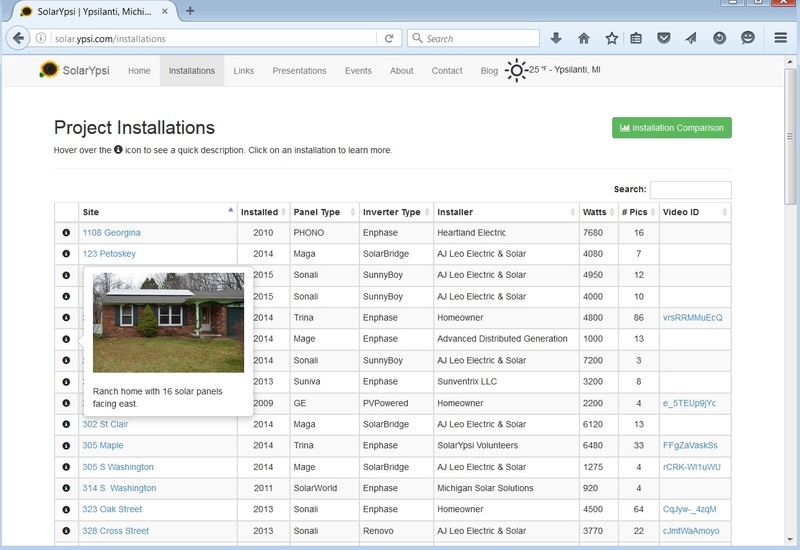 The new page (screen shot below) now allows the visitor to sort the solar installations on the Name, Panel type, Inverter type, Installer, Wattage, Number of pictures, or the Video link. This make it quick to navigate the many different types of solar installations and also makes it easy for SolarYpsi to look for errors in the descriptions. Go ahead and clink the link to check it out.